Norman P. Carlson has written a letter at Post Journal offering $10,000 for proof of Bigfoot. Mr. Carlson that is small potatoes! We respectfully decline your offer when the Fayetteville Freethinkers are offering a house. The Kemerovo government is offering $1M rubles (30k US dollars). Even Todd Standing is offering 2 Million for Bigfoot body parts. People who offer rewards for Bigfoot fall into two categories; skeptics trying to prove a point and promoters trying to make a name. Mr. Carlson falls into the former category. 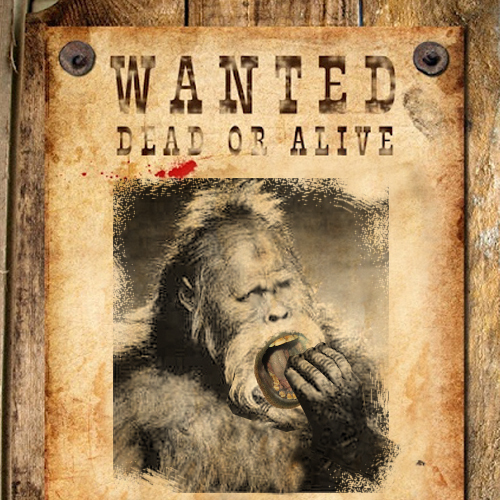 Either way, most of us in the Bigfoot community consider rewards for proof passé. It is not novel and not an incentive that drives us. You can read Norman's full proposal below. Where Is The Evidence Of Bigfoot’s Existence? The Big Foot conference was a huge success, I'm told. Hundreds of people came from all over. People had a good time. People spent money. People made money. People got to tell each other, "We know something those haughty scientists and rationality freaks don't." My guess is that, like the ghost hunting craze, it was a harmless but useless do-it-yourself Disneylike fantasy fest. No bones. No DNA. No scats. No convincing pictures despite all the automatic game cameras inexpensively available today. No real tracks. Not even a hair. Just eye witness accounts, the worst possible kind of evidence but to the people there, extremely convincing. Ask a psychologist, a cognitive scientist, a lawyer, an artist, or a cop about eye witness evidence. I'll bet there was little or no talk of what the big apes find to eat, where they find shelter, and even less of minimum sustainable breeding populations, necessary contiguous range, habitat destruction, and genetic bottlenecks. I will pay anyone $10,000 who brings me any scientifically certifiable remains of a previously unknown contemporary ape or human species - you don't even have to prove it is local, much though I would prefer - if you will agree to pay me $10 each year you don't. And to sweeten the deal, I will even name a star after your mother for an additional $25, less than half what that vendor on the radio who does the same thing charges. I have just as much authority and legitimacy to do that as he does. A Big Foot who resembles a man so strikingly would have to have a skeleton, including a skull, which resembles human examples. Police and hunters have a fairly good record of finding human murder victims' skeletons and skulls that are left in the woods. If there are Big Foots locally, certainly a breeding population would suffer a considerably larger number of deaths per unit time than the number of murder victims disposed of locally in the woods. So why doesn't anybody find their skulls? Maybe they bury their dead, one woman suggested to me. Oh, come to think of it, I maybe saw one at a farm auction last year bidding on a shovel. And maybe that guy I thought was a Neanderthal in my junior high study hall. This reward stuff upsets me,how would they like a reward put on their head.what we need is to help bigfoot and all the animals that live in the woods and forest by stopping all the building and save those area's for the wild.and as far as the big guy I feel he is more human than animal.to look at his face you would see man not animal.I know cause I have seen him. I'd take $10K over an unseen house in Arkansas. However, you are right. He should dig deeper if he is trying to make a point. I must admit though, I admire his business model of having others fund the reward. why would i turn in a hairy person,to get torn apart in some lab,thats why we would never turn bigfoot in,just enjoy the quest indiots! I'll take 5 mil cash ,no less for my Squatch body.